In this followup to volume I of A Season in the Life of a Confederate Soldier, Donnie H. Whitmire resumes the chronicle of the Chestatee Artillery. Each step of their journey is recorded from the time they left Virginia to the conclusion of the War Between the States. Whitmire pieces together their story from letters, census data, and more to recreate the bloody battles, the grueling trek, and the unbreakable will that kept these men marching forward. A Season in the Life of a Confederate Soldier is more than history; it endeavors to reveal the men behind the soldiers. It explores their fears and motivations, the moments when they could turn back but chose not to. What kept them going when tomorrow was never certain? 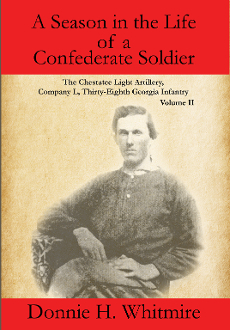 Included in volume II is a catalogue of the 183 men who fought in the Chestatee Artillery. Their service records, personal information, and more are meticulously documented for descendants and enthusiasts alike.